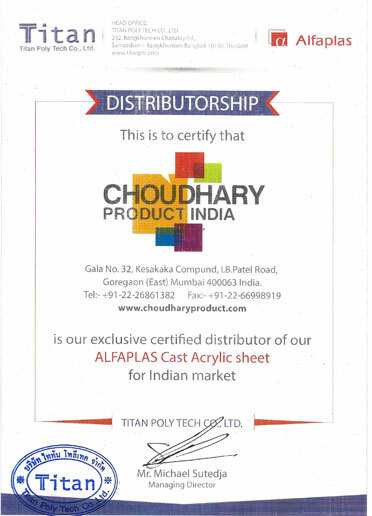 CHOUDHARY PRODUCT (INDIA) is experiencing growth at a very brisk pace, since its establishment in the year 1996, under the proficient headship of the honorable Proprietor Mr. NATHURAM TULSAJI CHOUDHARY. The profound knowledge and rich experience of the Proprietor has assisted the company to acquire distinguished position amidst the preeminent Suppliers of Cast Acrylic sheets and many more. With the help of our parent company with 30 years expertise in manufacturing premium cell cast acrylic sheet, we established our new facility in Petchaburi-Thailand. The first focus was local Thailand market. Excellence in service & product. Superb raw materials from international suppliers. Reasonably fast delivery ,Capacity to production lines. Efficient, skilled, Experienced & relatively lower cost labour. Competitive Edge with Long term peace of Mind.